What Is the Size of a King Comforter? Not all kings are created equal, and before you buy a comforter for a king-size bed it's best to understand what kind of king you own. A standard, also known as Eastern king, is longer but narrower than a California king. 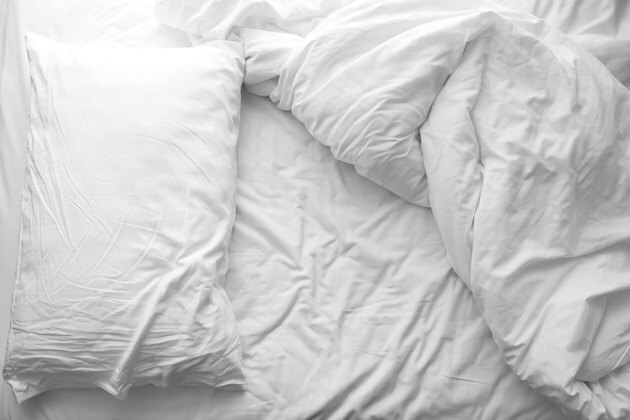 Choose the proper bedding to be sure that there is ample coverage for everyone who shares the king-size bed. A standard or "Eastern" king is the most common king-size bed. When furniture or mattress shops mention a "king" in advertisements or in a showroom, they're usually referring to the Eastern king. Comforter packages that have "king" on the labeling are also referring to an Eastern King. An Eastern King measures 76 inches wide by 80 inches long. Because the Eastern King is more common, it's easier to find comforters for this size bed. This is especially helpful when trying to match a specific color or style scheme. A California or "Western" king measures 72 inches by 84 inches, making it both shorter and wider than a standard king. Because California Kings are less common, it's also more difficult to find bedding in this size. It could be a challenge to match a specific color or design scheme because there are fewer options available for California king owners. Furniture and bedding options in this size will be more specific and labeled as "California king." Always read all labeling to ensure proper sizing when choosing a comforter for a king-size bed. The comforter should cover the entire length of the bed with enough "hang" on each side so everyone in the bed has enough coverage. Using California king bedding on an Eastern king could mean extra width, but it won't cover the length of the bed, which could be a problem for a taller person. On the other hand, covering a California king with an Eastern king comforter could mean a lot of pulling and tugging covers away from each other as each person in bed vies for the most coverage. Whether California king or Eastern king, choose bedding that matches the bedroom's décor. If it's hard to find comforters in a particular color scheme, consider buying a neutral comforter in the correct size and covering it with a comforter cover in the right color or design scheme. If it's hard to find any bedding in the proper size at the usual bedding stores, try searching online stores such as Overstock and Amazon. What Size Are King-Size Pillowcases? How Long & Wide Is a Queen-Size Mattress in Feet?